Your homeschool review can occur daily, weekly, over the weekend, and even during extended breaks for summer, fall, and spring holidays. Many choose to do some form of homeschool review over a summer vacation to take advantage of the lengthy period to continue teaching, instead of suspending learning altogether. None of us want to risk losing ground with our children's academics. I have never known anyone who was required to complete additional homeschool courses during summers when other children and parent-teachers typically enjoy a summer vacation. 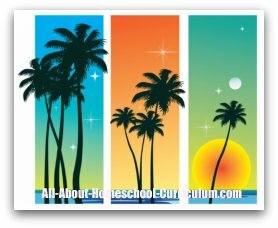 If you use the summer months for homeschool review, please share with us how you do it and why. We would love to hear from you. Most often, though, summer home school review is done on a lighter schedule than what is done during the formal school year. Our home school day starts a little later than usual and ends earlier than during regular times. We have found it best to do our studies during the hotter part of the day when outdoor activities are limited. There are fewer exams and more creative, independent expression. Also, homeschooling may occur outdoors or even at the park, followed by a picnic lunch. Bible, reading, and math are always a part of our lessons, though. Even if they come in the form of DVDs or computer games, we include those subjects each day. I asked my daughters aged 19, 17, and 16, to share their thoughts on this topic. Immediately and unanimously, they came back with…"those big workbooks!" They were referring to the comprehensive workbooks such as Summer Bridges by Carson Dellosa Publishing. We have used these for years and love them! These books are graded and allow children to review and practice the skills already learned and prepare them for the next year’s work. They also include fun activities in addition to the daily work. You can also very easily use these for shorter periods of time. But, if the Summer Bridges books are not what you are looking for, there are many other types of books that would be ideal for use during summers or other holiday vacation times. Remember, that if you still have unused pages in current workbooks, those will do just as well for reviewing work with your children. In the past I have even ripped those pages from the workbook, inserted into folders, and allowed our children to create their own personal covers! Then, they became something new and not just unfinished pages in a current workbook!